Dr Ken Lee is the Director of CSIRO’s Oceans and Atmosphere Flagship leading a national team of multidisciplinary researchers that work with industry, government and communities to protect, understand and maximise the vast wealth from our oceans and coasts and atmospheric assets. The Oceans and Atmosphere Flagship focuses on the areas of ocean modelling and observing, the ocean’s role in climate change, sustainable use and conservation of marine resources and biodiversity, sustainable development of offshore energy and mineral resources and multiple-use management of marine and coastal ecosystems. Sought after the world over for his expertise in oil spill counter-measures, Dr Lee’s recently contributed to a report (July 2013) on the Gulf of Mexico oil spill by the US National Research Council which noted the importance of fully understanding the economic and social impacts of the spill. At CSIRO, Dr Lee promotes research and development and the application of emerging technologies in ocean sciences to increase Australia's global competitiveness. 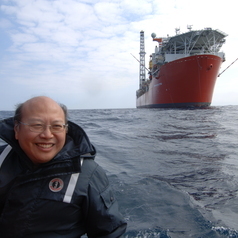 Prior to joining CSIRO in 2013, Dr Lee was the founding Executive Director of the Centre for Offshore Oil, Gas and Energy Research (COOGER), a Centre of Expertise (COE) in the Department of Fisheries and Oceans, Canada. The COE was responsible for the coordination and implementation of collaborative national and international research programs with industry and academia to provide scientific knowledge and advice on the level of environmental risks associated with the development of Canada’s offshore oil and gas, and ocean renewable energy sector. In recognition of his ability to champion support for research in marine sciences, Dr Lee was elected by his peers to serve as Chair of the Canadian National Committee for the Scientific Committee Oceanic Research (SCOR) of the International Council for Science (ISCU). In 2010, Essential Science Indicators (ScienceWatch.com) identified Dr Lee as one of the top 10 scientists in oil spill research during the previous decade - based on the total papers and citations. Dr Lee has coordinated and led major international collaborative research programs with involving federal government agencies, academia, industry and the public. Deliverables from these research programs have supported the development and revision of national policies and regulations and international standards and governance for the protection of the marine environment.